It was an emotional weekend for Florida resident Brian Forrester, who attended his 50th consecutive NHRA U.S. Nationals at Indianapolis. He has been attending every year since 1969, when he was only four years old. And just like that, a tradition was born. The Forrester family began attending Indy over Labor Day weekend every year, and did so for many years together. In 1977, Larry decided he was interested in racing himself, and began competing in bracket racing in Illinois. 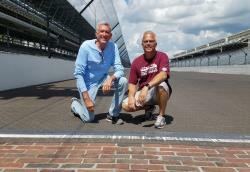 Due to his father's racing schedule, Brian's mother, Nancy, took him to Indy that year. "For her to take me that year was really cool," he said. "I would have never been able to make it to 50 if she hadn't done that for me." Brian also got the racing bug—going so far as to write in his high school yearbook that his dream was to win the nationals one day at Indianapolis. 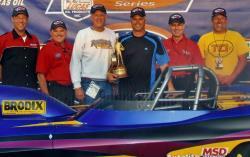 He began racing in the NHRA Super Gas category in 1989. From that year until 2010, Brian attended Indy every year as a competitor. After finally achieving his dream, Brian decided to retire from racing in order to spend more time with his family—his wife, Robin, and their two children. “I give him credit for that,” Larry said, in reference to Brian’s choice to leave the sport. Brian continued working in the racing industry for some time, building racecars, before transitioning into a career at an automobile repair company. Still, without fail, he returned to Indy over Labor Day weekend each year.